I like to give my customers a test before they leave the shop. It helps me determine their perspective on art. It is a fun bit of market research. Which of the two bears do you prefer? It does say something about you. It is not a right or wrong type of question, but it will help you understand why you like doing some things and not others. 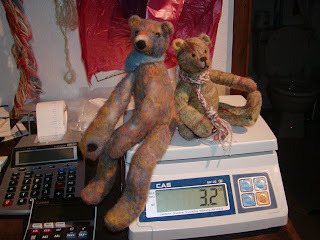 My friend, Rosey, made one of the bears and I made the other. Can you tell who made which one? Let me know when you visit the shop. I try to guess and by the end of the visit, I can usually tell which you prefer, before you even tell me!